Join us for a great time at Tailwaggers' Photos with Santa Event. All the proceeds benefit the Task Force. A big thank you to Janey, Jim and Patty at Tailwaggers; our dear Santa Bob and our fabulous photographer, Jane, of Kleinschmidt Art & Design, LLC; and all of Santa's helpful volunteers. 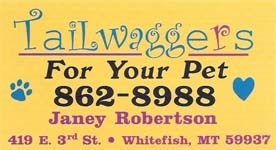 Visit Tailwaggers in Whitefish for a large selection of high quality pet food, and check out their fabulous assortment of pet accessories. 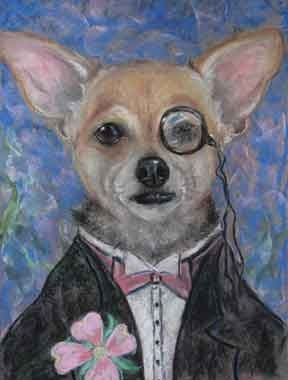 Commissioned Pet Portrait, "Sadie on the Towne"